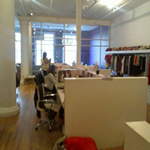 Begin to search for Tribeca office space at NewYorkOffices.com. 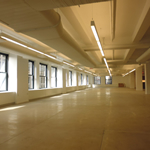 We offer dozens of commercial properties for lease and rental in Tribeca greater than 1,000 Square Feet! 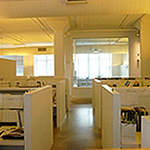 The "Triangle below Canal Street"
Tribeca Office Space for rent, sublease, and sale; view prices, floor plans, photos, and more - for available commercial real estate in Tribeca Call or Click today. 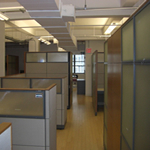 Search for offices in Tribeca, Manhattan with dozens of office spaces available daily! Tribeca is known for its sleepy cobblestone lanes, bygone industrial architecture transformed into luxury grade residential conversions. The area is highlighted by a world-class cuisine by some of the finest top chiefs housed in industry leading restaurants. Today the neighborhood stands as one of the nation's most fashionable districts which is commonly inhabited by celebrities and the elite alike. The area contains a high percentage of lofts which are available for lease or purchase. Space is at a premium and prices in the area reflect. Fortunately there's always a loft available on either side of the market; commercial or residential. So if you're in the market for Office Space, Medical / Healthcare Facilities, or a commercial condo property we can assist you with your search. Office Steps from Canal Perfect for Start-Up Magazine or Web based Operator – Excellent Location on Lafayette, this professional space stands in a commercial loft building and offers 2,326-square-feet of space. Entire floor through, there is one office and / confrence room built out. The space has a two bathrooms. Currently Under Renovation. Large windows with good exposure to the South keep up the creative spirit and a kitchen with ample space for snacks and coffee offers fuel for late-night. Best of all, however, this space stands just above a turn-of-the-century distillery ideal for regular – and extremely unique – magazine and other launch parties, perfect for advertisers! Lots of Windows with great Light Central air conditioning Open High ceilings Great Condition Exceptional Value Close to Transportation and More! Greenwich Street for Lease 3,408 SF. / $66 per SF. Made-to-Order Office in Start-up Hub of Manhattan – This 3,408-square-foot commercial space in the middle of Tribeca – one of the fastest-growing, popular districts of New York City – fits the expanding needs of any new media/tech company. With fantastic natural light, high-ceilings and 18’ of West-facing windows, employees have a beautiful view of the Hudson. The landlord of this Class-B property will install most office layouts whether open, cubicle or bullpen. A conference room, a wet pantry and two restrooms are no-hassle added extras. Some of the city’s finest dining lies just South of the building, including restaurants Locande Verde, Landmarc and Takahachi – all rated among the 10 best by the Village Voice. Mid-Floor 3,644-SF Office on Hudson Waiting for a Creative Touch – Though located in a recently purchased Class-B building, this 3,644-square-foot office offers plenty of room for innovation and creativity. 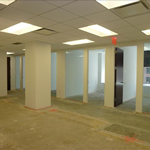 User friendly management will configure this floor to any specification, though the space and size ideally suits it for New York bureaus of small nongovernmental organizations, global think-tanks or the headquarters of a small(ish) international trading firm. An accessible freight elevator aids in the movement of promotional materials, equipment or retail. Management has also agreed to install all the necessary equipment for advanced telecoms and collaborative workspaces. Nearby hotels, such as the Tribeca Grand, the Algonquin and the St. Regis help make the transition to cosmopolitan Manhattan easy! Qualifies for Lower Manhattan benefits and grants. 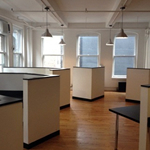 Tribeca Office Sublet for Rent 4,500 SF. / $?? SF. This Office Sublet Offers a Stylized Work Environment – Though Class C property with fewer amenities than the surrounding new construction (think loft-ish space with self-secured entrance), this 4,500-square-foot shared office space stands in a cast-iron building featuring an open loft-style layout with room to acommodate anything from, custom-made cubicles with drafting tables to other collaborative workspaces for creative endeavors. Amenities also include CISCO conferencing, high-speed broadband Internet connectivity and XBLUE phone systems. On the cobblestone streets of old New York, the building adjoins a stretch of New York’s most famous galleries – it’s the new turn on the old-school artistic occupation of Tribeca! 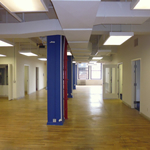 Tribeca Office for Lease 4,700 SF. / $?? SF. Upper-Level 4,700-SF Space in Turn-of-the-Century, Landmarked Building – Perfect for an up-and-coming commercial real estate brokerage, consulting firm or other business, this 4,700-square-foot, 12th-floor office in a Class-B, landmarked building stands in the center of Tribeca’s famous Cast-Iron District. Built around 1865, an era in when architects specifically designed structures around the intricate iron patterns, this building is circled by natural light on two-sides (corner unit). But just because the building is classic, the office space certainly isn’t outdated. Modern, made-to order office cubicles and a newly renovated kitchen and bathrooms are some of the many features the space includes. Many of Tribeca’s trendiest, refinished bars along Franklin street make staying in the neighborhood after work a must-do! 21st-Century Outfit in Eco-Friendly Varick Street Loft – Renowned Manhattan management company is looking for an established law firm, accounting firm or brokerage to take over this 5,000-square-foot, floor-to-ceiling windowed, open loft space in a Class B renovated building built at the turn-of-the century. Featuring all the basics of a 21st-century Tribeca office – advanced CISCO video conferencing capability, high-speed WiFi and a stainless-steel kitchen – the building’s eco-friendliness is a big selling point. As many other renovated downtown buildings, the owners have installed new piping to reduce waste-water flow, walls made of recycled material and energy efficient electrical. Walk outside and compare the Tribeca wrought-iron landscape with that of nearby SoHo. Chambers Street Office for Lease 5,870 SF. / $65 SF. 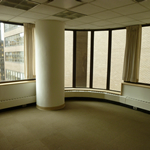 Broadway and Chambers High-Rise with Spectacular Views of Downtown – Renovated to draw some of the most prestigious corporations and incubator firms downtown, this 5,870 - square-foot, upper-floor office in a Class-A building is prepped for instant occupation. A large, open reception area provides a stylized entrance to newly redone offices and cubiclesnewly neutral-painted walls and an embankment of large windows with a view of downtown via Broadway Street. The large lobby downstairs has also been newly redone with marble floors and counters, behind which a 24-hour security crew sits and commands an automated entry system – a must have for downtown New York. Uptown straphangers are close to the 7th-Ave. A, C, E, which stops at both Penn Station and 42nd Street; Brooklyn and downtown commuters can take the same line home! Production HQs Steps from Entertainment Center of New York – LA may be the place where most of the staging happens, but New York City still runs the Festival strings. This 6,210-foot office space features a120-pound-per-foot load floors with concrete columns, mushroom capitals and drop plates that can support the heavy machinery to move all the necessities of a sound stage. Perfect for big equipment and or storage, with a negotiable price - this space fits the budget of an indie movie house looking to grow and provides a close-knit tie to the venerated Tribeca Film Festival! 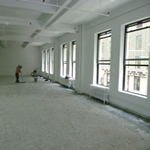 Vesey Street Showroom Space for Lease 7,300 SF. / $50 SF..
Vesey Street Office Space / Showroom – Steps away from the Hudson, in this former artists’ habitat, this 7,300-square-foot space in a Class B building on a 2nd-floor is perfect for an office loft. With 12’ ceilings and a large backroom with room for storage, possibilities abound. For the right lessee, the landlord will renovate the space and reconfigure the storage area to the closest of specifications. Furthermore this space includes; File Room & Reception Area, Glass Enclosed Conference Room, and Pantry! Here's a great opportunity to lease an office in one of America's most fashionable and desirable neighborhoods known for its celebrity residents that can’t be beat! Neigborhood Details Noteworthy Properties:32 Avenue of the Americas, 388 Greenwich Street, The American Thread Building (260 West Broadway), The former New York Mercantile Exchange (6 Harrison Street), The New York Telephone Company building (140 West Street), The Powell Building, The Textile Building, . Organizational / Corporate Headquarters in the Area: Midt as well. Nearby Landmarks: African Burial Ground (Duane & Broadway), City Hall, Washington Market Park, Tweed Courthouse, and The Woolworth Building. 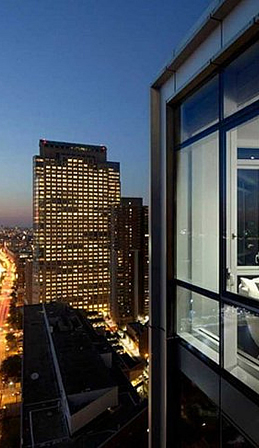 Hotels in the Area: The Cosmopolitan Hotel Tribeca, Duane Street Hotel, The Greenwich Hotel, Hilton Garden Inn New York, Sheraton, Smyth Tribeca, and the Tribeca Grand as well.